Music I found this video online when looking for Attack on Titan theme music~ I take no credit for this video, but please check out the maker of this, it's amazing! All credit goes to FrancoeurxThexFleax. Armin is rather short for his age with a small build. Armin has a round face, framed by his blond hair, with large, expressive blue-eyes and a pudgy nose. In his childhood, Armin wore a long-sleeved single-buttoned jacket with a collared shirt, long dress-pants and dress shoes. As a member of the 104th Trainees Squad, Armin wore the standard 104th Trainees Squad uniform. After graduation into the Survey Corps, he wore the standard Survey Corps uniform. Underneath his short brown jacket, he wears a white and collared button up shirt, similar to the one he worn as an adolescent. Like his fellow comrades, Armin accompanies his attire with a large green cape when participating in the 57th Expedition outside the Walls. 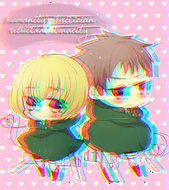 Growing up, the naturally curious Armin had a deep fascination with the world beyond the Walls, and even enthused his best friend, Eren, into sharing this passion. Much of his free time was spent reading any book about the outside world he could find, but he would be branded a heretic for his unusual interest, and was frequently picked on. 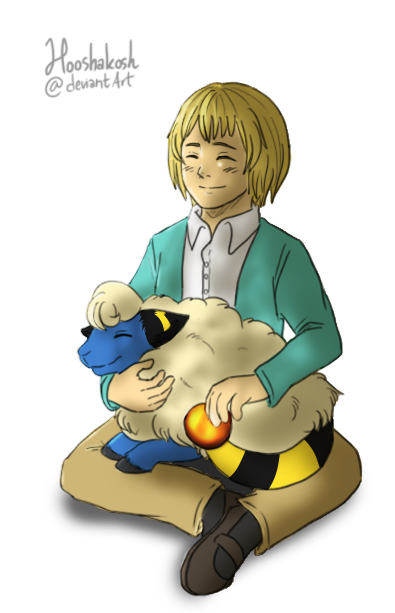 Too timid to defend himself, Armin would often need to rely on his friends to protect him from local bullies. This, coupled with his frail physique, was a source of much shame for Armin, leading him to have poor self-esteem and believe himself to be a burden upon others. Because of this, Armin was very eager to prove his worth, with his ambition being to one day stand on equal footing as his friends. Armin is exceptionally loyal and selfless, constantly worrying for the safety of his friends, and ready to throw himself into dangerous situations for them; even offering to sacrifice himself for Mikasa. 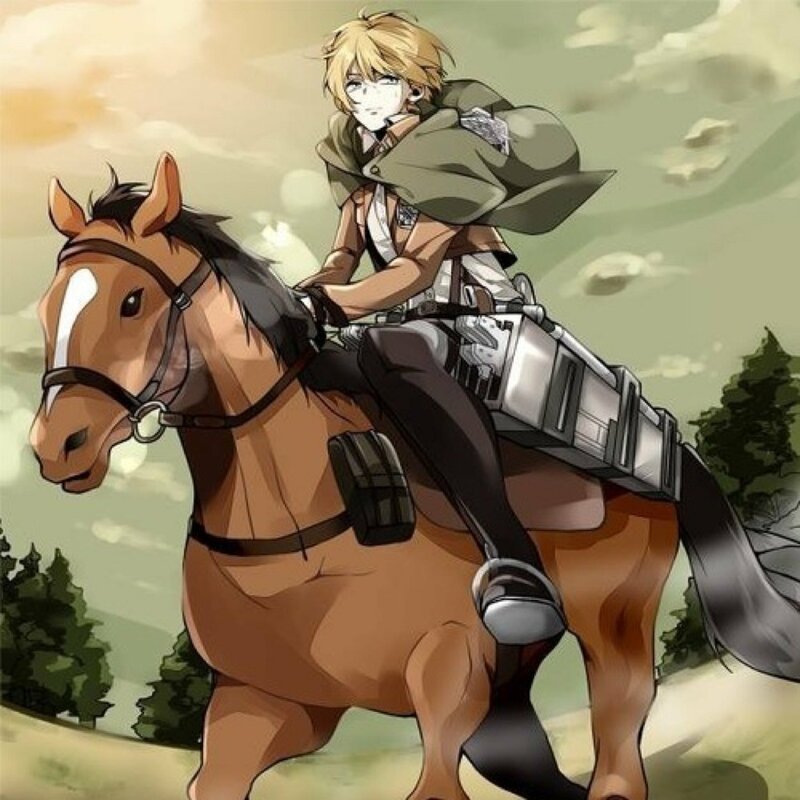 When he, Jean, and Reiner had to decide who would be left behind without a horse, Armin immediately offered himself without hesitation. And when Jean was injured in battle, Armin rushed to his aid, placing himself in danger as well. Armin is also very level-headed, keeping Eren and Mikasa under control when their emotions get the better of them. He has talked down a fight Eren started with a soldier, and restrained Mikasa from acting rashly during Eren's military trial. Although initially meek and a bit cowardly, Armin acknowledged these weaknesses, letting his potential shine brighter as he gradually gains more confidence in himself. Relieving himself of doubt, Armin has shown great investment in humanity's future, always striving for and thinking on how he can change things for the betterment of mankind. However, Armin's life has also left him considerably jaded, and he has come to believe pragmatic actions and great sacrifice are necessary for change. Armin admires strong leaders such as Darius Zackly, Ian Dietrich, and Dot Pixis for their ability to sacrifice themselves in order to put humanity further. Armin's most consistent traits remain his kind heart and keen intuition, making him often concerned with the group's morality. Jean approached the horses, shouldering a column of hay. He had tangled with Titans often, but he never wanted to lose his life. During battle, he always played his cards close to his chest, circumspect and eschewing risks and unnecessary bravado. He wanted to help further humanity, but he had never been prepared to downright die. If there was anything that made his blood run cold, it was a useless, ambigious death like Marco's. He started tearing off the hay and disposing it into each of their stables. The air was frigid and Jean wanted to head back inside as soon as possible. He paused when it was his horse's turn to feed, recognizing his sludge brown coat. The Corps had been in a slough of inactivity, and Jean realized he looked a trifle bleary-eyed. "Just hold on, Buffalto. Things'll pick up soon enough." He held out a morsel and his animal appreciatively ate out of his hand. Jean extended his free hand to caress Buffalto's velvety nose, lost in the swerving whirlpool of his own cogitations. Armin's voice rang out and Jean canted his head in his direction. "Orders...?" He took the paper and perused it with care. "We're retrieving supplies? Alright... Buffalto could use some action." He said, patting the horse. "Hey, Armin... if you're done minglng with the higher-ups, mind giving me a hand?" The cold was starting to seep into his bones and the horses still needed water. Besides, they still had seventeen hours until the expedition was set to start-surely Armin could spare some time, right? //Okay. SO, I know my comments are off but I just wanted to drop this by to say I MISS YOOOOOU! ♥ I know you can't respond to it comment-wise, but, I just wanted to let you know. ALSO, that I'm working on a response to our roleplay! Thanks again for being super patient! I was like, tempted to bug you like - "You should roleplay with me on Aureus!" But I know I just keep tossing you into random roleplays with all these characters and I just feel super bad when we can't continue them. XD; But, I can't help it! But, I did control myself this time around (for now). I'll actually still bring that up as a possibility... Yeah. You can still expect me to hit you up with that then. ANYWAY, yes! I'm working on a reply and I'm stoked to get it out to you! "Hey Armin thanks for the add. Hmhm i have a titan myself. Although it looks quite different. It's a shame to hear it didn't work out with the 4-Player Group you tried to form with your friends. Do you still at lease play with some of them? PvP isn't quite my forte with video games since I'm a total CareBear. That may be why I usually play single player games or like ones with Co-Op and a common goal. Though, competition can be fun too! I just recall having a lot of experiences with people who take it quite far. XD I can see why PvP with people with maxed out everything isn't the easiest.� At least you still enjoy yourself! Sieging castles and towers does sound neat! Awww! Yay! I hope you didn't feel forced to get a headset. XD Haha. I'm sure you'll be able to use it for other occasions as well! Though, I did send you a message with my PSN so we can exchange them privately. I hope you had a great weekend and you enjoyed dinner with your family at Applebees on Sunday! Did you get some cheese sticks?! That's so cool your dad is part of a band! Do you guys watch him perform? I know, right?! When that happened, I just HAD to tell you! I can totally see that happening too. Oh God, he'd totally mess with their minds. Eren and Mikasa are in Fight Club too. It was great, they all work out, get into fights, grab some food, and then go out for karaoke afterwards. 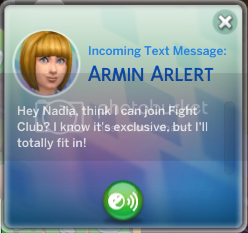 XD Nadia and Armin actually had a child together there also. They had a son and he was like the epitome of perfection. Lmfao. XD He was handsome, enjoyed reading, did great in school, but he was hot-headed. That scenario would be super great~! ♥ That sounds like a good step if you ever decided to get your own apartment. Living with strangers can be sketchy, I've witnessed and heard of awful stories that come along with that. I've also seen people (and personally experienced) living with friends. Someone usually ends up chipping in more than the rest (whether they want to willingly or not) or someone lags behind and doesn't put in as much effort towards household chores or something else along those lines. Especially since living with someone is different from hanging out so you all just kind of get tired of each other quicker. But, having separate rooms helps with privacy a lot. Like, in my current roommate situation, I picked up a chore board and a community calendar to help keep things organized and efficient. But after a few months I just stopped the chore board since it wasn't followed properly and people still lagged behind. But, the community calendar is still effective! So, there's that! Though, hopefully in the future if you get your own place you won't have to worry about that nonsense! OH! 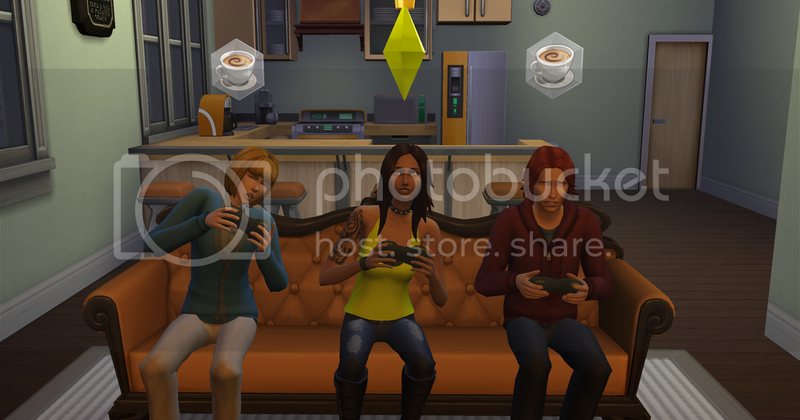 And here's one of Armin, Nadia, and Kohaku (another roleplay friend of mine who sent me his sim) playing video games in her very first apartment. So, it's like, dinky looking. Lmao. I considered making a new character since it's been way too long since I played, I want to be able to get accustomed to playing again. Haha. Elder Scrolls is a fantastic series! I felt like the MMO Style fit well, I didn't play with anyone beforehand so it almost felt like playing the traditional game to me. XD That's great to hear they had an update like that! I had an Orc before, I make re-make her or I may make something different. Still deciding! Haha. Do you take part in PvP often? Sure! That works out for me, we can try out the instant chat on our computers for convenience. But, if you aren't opposed to picking up a headset for our ventures, I think that may make it even easier for us! Where did you want to trade PSN's? Did you want to do it through Comments or Messages? I'm glad you think so! The pasta was super yummy so I was more than happy to grab seconds. XD And your holiday sounds eventful! It's great you were able to see both sides of your family! Being able to spend time with everyone sounds incredibly lively! Haha. Oh my gosh, that is a buttload of turkey! On the bright side, you didn't go hungry? XD; Haha. What was your favorite part of the meal? Same! I totally agree! 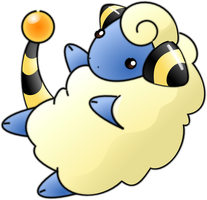 ♥ As long as we can chat from time to time, I think that helps soothe my addiction to our conversations~! ♥ Awww! Yay for tooper mutual missing!